Hello! This past weekend, I traveled home to Richmond to spend a couple days with my boyfriend. I also snuck in a quick shopping trip to Forever 21 while I was home. And it was perfect timing for a trip to Forever 21- all of their sale items were an additional 75% off of the sale price. Talk about a crazy good sale! When I spotted this dress on sale at Forever 21, I knew that I had to have it. I was immediately drawn to the black color, peasant-style silhouette and bold seventies-inspired detailing. Originally this dress retailed for about $35 but it was marked down so heavily that I purchased it for a little less than $2. That's less than I pay for lunch! I can't even get over how happy I am with this purchase. I have a feeling that this neutral seventies beauty will become one of my wardrobe staples this upcoming spring season. I can't wait to break it out with boho wedges and bright lipstick. However, for this look, I had to layer up to stay warm. 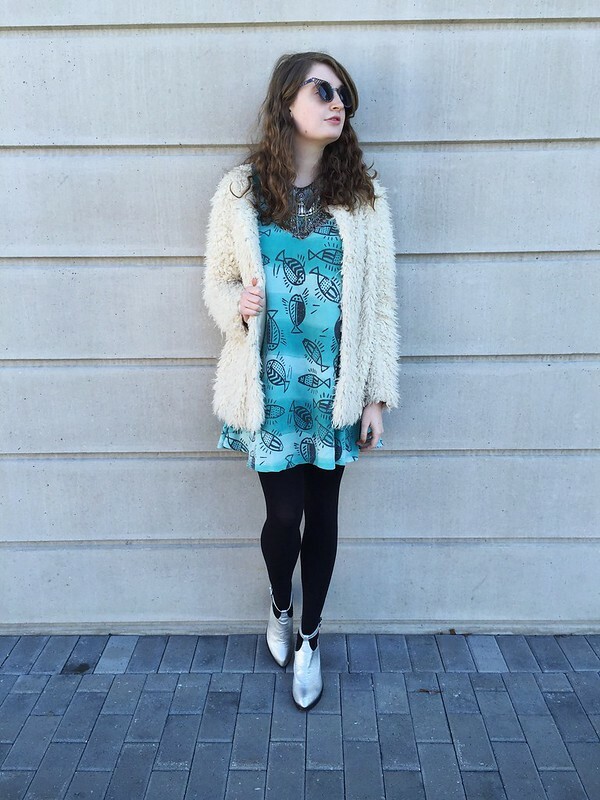 I paired a cream-colored faux fur jacket and opaque black tights with the dress. I wanted to play up the sort of delicate vintage-inspired mood of the dress and styled it with a golden vintage purse, simple golden jewelry and feminine heels. Stay tuned for all of the other ways that I plan on styling this dress! Hello! As you guys probably know, I've stopped using heat on my hair for the past few months. I've been focusing on keeping my hair healthy to promote its growth and an enhanced appearance. 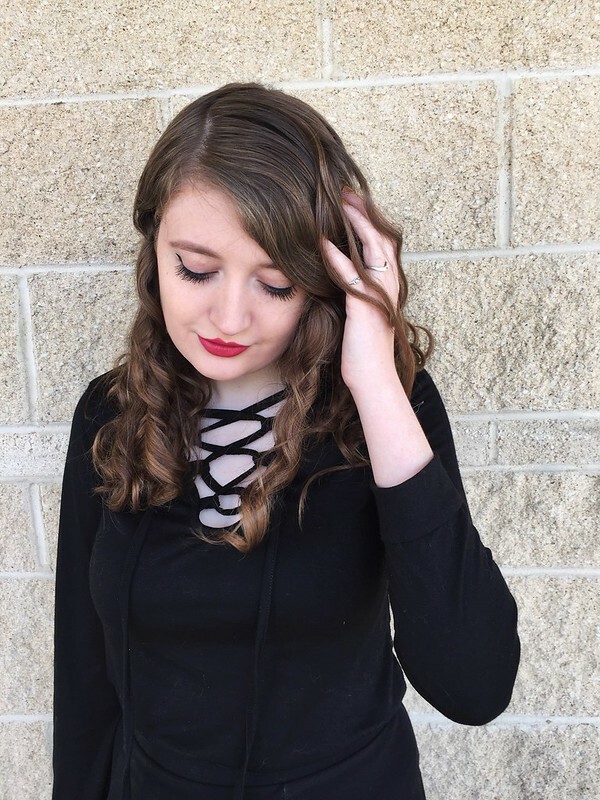 I essentially never blow dry my hair or straighten it but for a while, I was relying on my curling wand a little too often for "touch ups" to my naturally curly hair when it probably didn't need to be fixed up. As cheesy or as ridiculous as it may seem, my hair seems a lot happier now that I've stopped using heat on it. 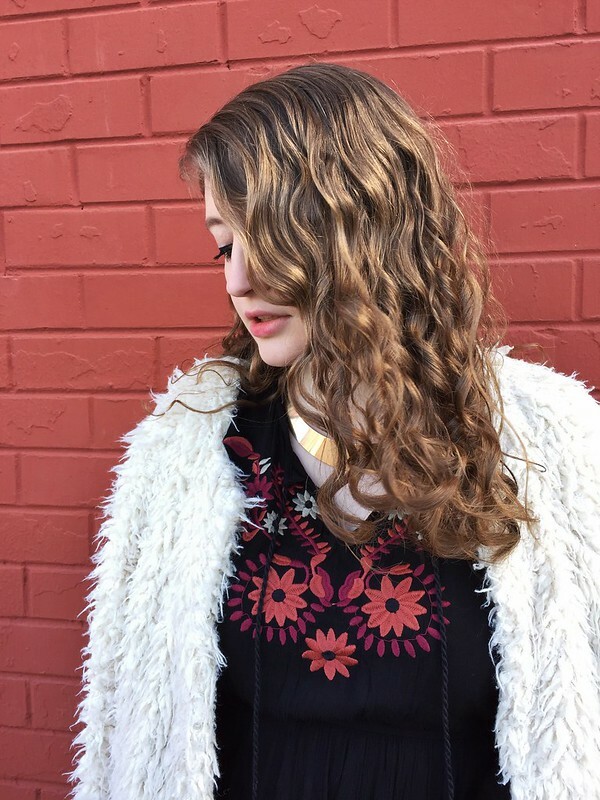 It feels softer and the naturally curly texture of my hair seems as if it's enhanced. Since I've stopped using heat on my hair, I rely more on products such as curl-enhancing mousse to tame my mane. And a couple months ago, Garnier sent me complimentary products from their new curly hair line, Triple Nutrition Curl Nourish to test out. They sent me the shampoo, conditioner, leave-in conditioner, curl stretch loosening pudding and curl renew reactivating milk spray. I've been using the products for a few weeks now and I'm hooked. I deal with less frizz and softer curls and what's better than that? If you have naturally curly hair, I would definitely recommend trying out this product line. All products cost less than $6 individually and will majorly boost your hairstyle. In particular, I really LOVE the curl renew reactivating milk spray. After I shower, I comb my hair, apply this spray, scrunch my hair and I'm left with perfect curls. Another thing I love about this spray is that it feels super light-weight, I don't feel like the product is weighing my curls down. Another plus? This spray as well as the other products in the line smell amazing- very fresh. One thing is for sure, when I run out of these products, I'll be headed off to buy more. If you have naturally curly hair like me, I'd also suggest trying this line out. Hello! For the past couple weeks as I stand in front of my closet trying to figure out what to wear, I'm having an increasingly difficult time styling new looks. The harsh winter weather seemingly makes dressing stylishly about a hundred times more difficult. I gaze longingly at my platform wedges and vibrant spring dresses before I sullenly pull out yet another black dress or faux fur coat to style my outfit around. I'm impatiently counting down the days that I'll be able to ditch winter coats entirely and care-freely step outside with bare legs. But for now, I'm stuck working around styling looks that will be appropriate as snow falls all around me outside. When I can't think of what to wear, I typically just throw on all black and call it a day. And I've been having a sort of styling block the past few days so it's been a lot of black for the past few days. As much as I love all black looks, there is something as too much black. It can get boring, dull and feel somewhat tired. 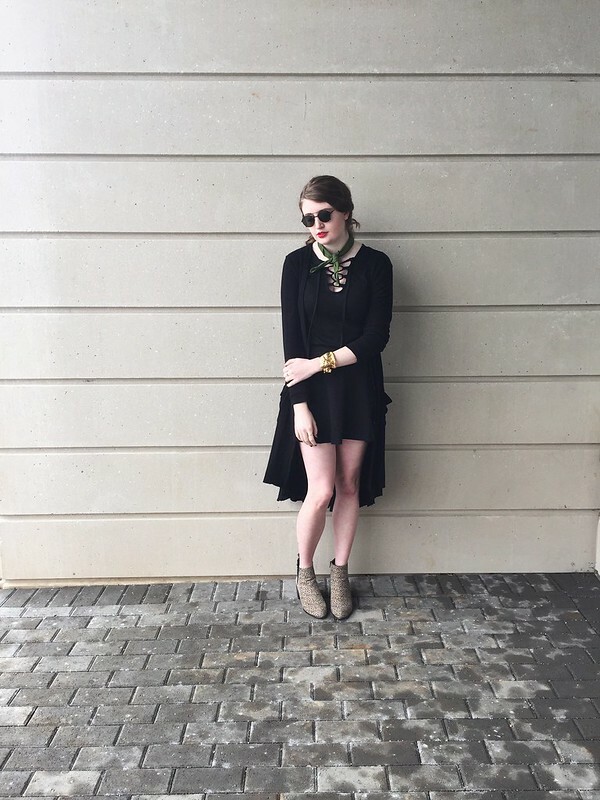 For this look, I wanted to break that pattern of wearing primarily all black. I decided to pull a floral dress out of my closet that I would typically reserve for the fall or spring. The airy silhouette and light fabric make this a dress not as suited for winter but I just love the deep colors, mod floral print and swingy silhouette and couldn't resist wearing it any longer. Additionally, there's sort of a retro sixties/seventies feel to this dress that I love. To make it appropriate for winter, I knew that I would need to layer. 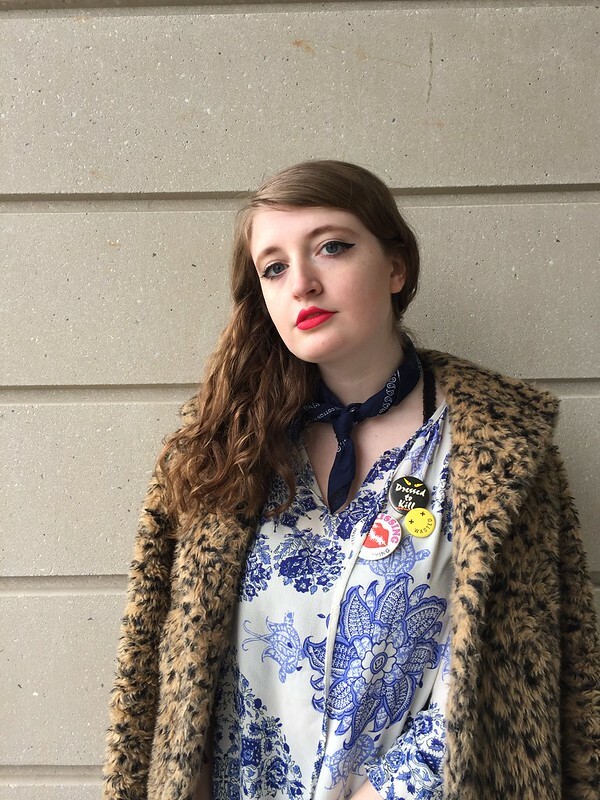 I decided to play up the sort of sixties/seventies vibe of the dress by layering a leopard print, long-sleeve button down top underneath the dress. The leopard print of the blouse and the floral print of the dress effortlessly complement each other. Also, I love the way that the collar of the button down playfully peeks out from under the dress. The high collar of this top sort of reminds me of something that Twiggy would have worn in the sixties or the seventies. I wanted to draw attention to the collar of the button down so I decided to accessorize with a few necklaces. I pulled out four different necklaces to layer together- three golden crystal necklaces (to emphasize that sixties free-spirited vibe) and my golden "Tori" necklace. I slipped on a pair of golden sunglasses to complement the golden color of my necklaces. A feminine shade of pink lipstick pulled all the colors in the outfit together. 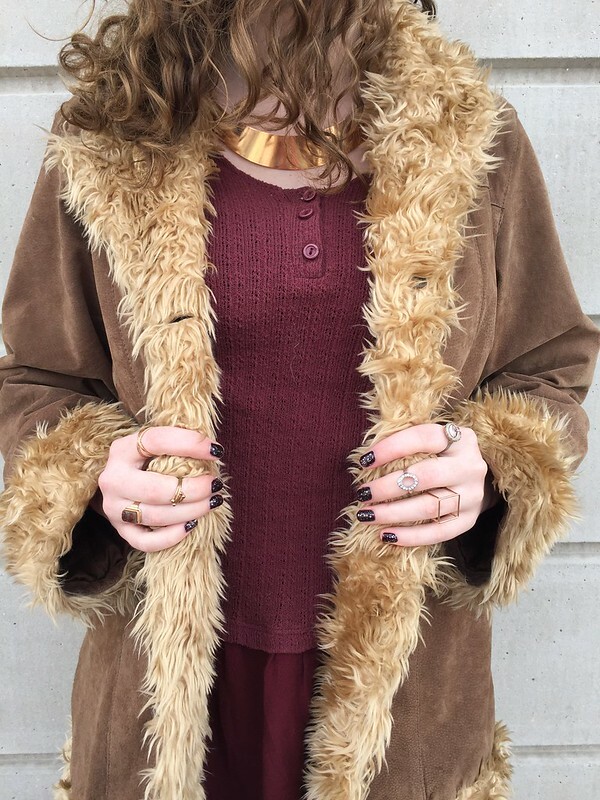 To keep warm, I layered a neutral tan coat over this outfit. I also slipped into a pair of burgundy thigh-high socks to highlight the shades of maroon in the dress. I styled a pair of neutral leopard print booties with the socks to contrast the leopard print pattern in my blouse. Hello! Right now, I can't get over how much I'm loving the fluffy, faux fur heel trend. These ladylike heels detailed with feminine poufs of faux fur are practically calling my name. There's something so dreamy, over-the-top feminine, almost princessy-prissy about this style of heels that I can't help but to love them. They're ridiculously impractical and I think that may be one of the reasons why I'm drawn to them. They represent the fantasy that fashion can portray. Not everything in fashion is practical (in fact, almost half of what is strutted down the runway is impractical) but fashion isn't about practicality, it's about fantasy, it's about imagination, it's about creating an aesthetic. And I think that this trend represents that flawlessly. 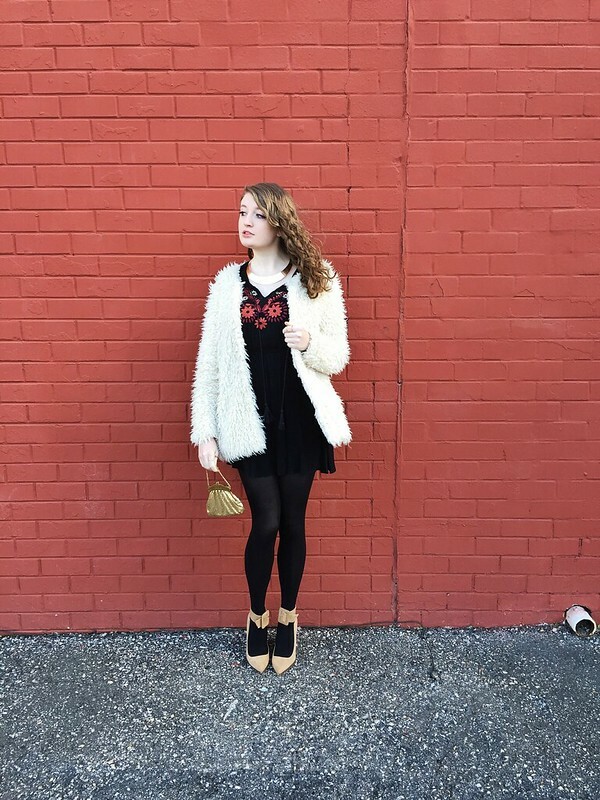 I probably won't be trying this luxe trend out because after all it is impractical and I'm on a college budget but if you're interested in trying out the trend, I love this pair and this pair of faux fur fluff-adorned heels. Hello! Ugh, I'm SO over this cold weather and the necessity of donning thick tights and faux fur coats everyday. Spring, where are you? I currently only have a few winter coats with me at school and I'm getting sick of wearing the same coats day after day. 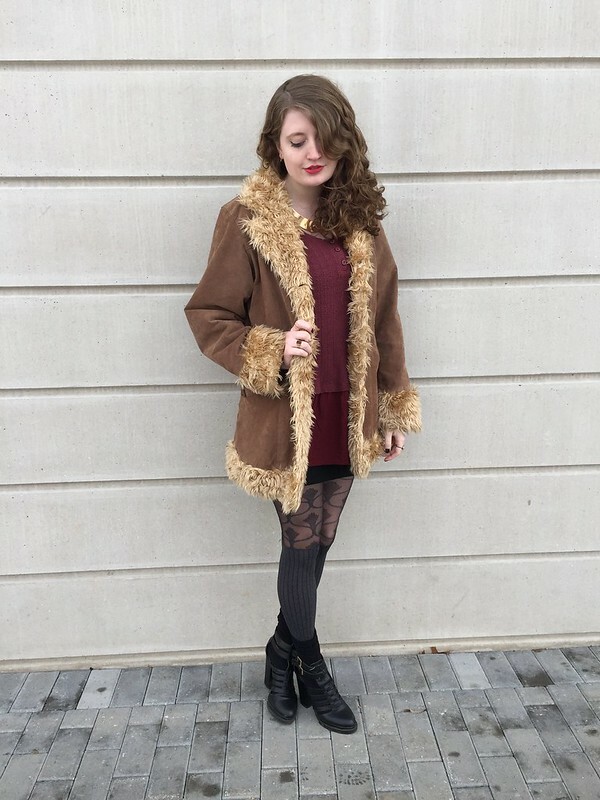 Wearing the same coats with the same style of tights day in and day out can give off the appearance of wearing the same (or at least very similar outfits) everyday. To distinguish my outfits from one another, I've been relying heavily on bold outfit details. For this look, yet again, I slipped on another pair of basic black tights and grabbed my leopard print faux fur coat. 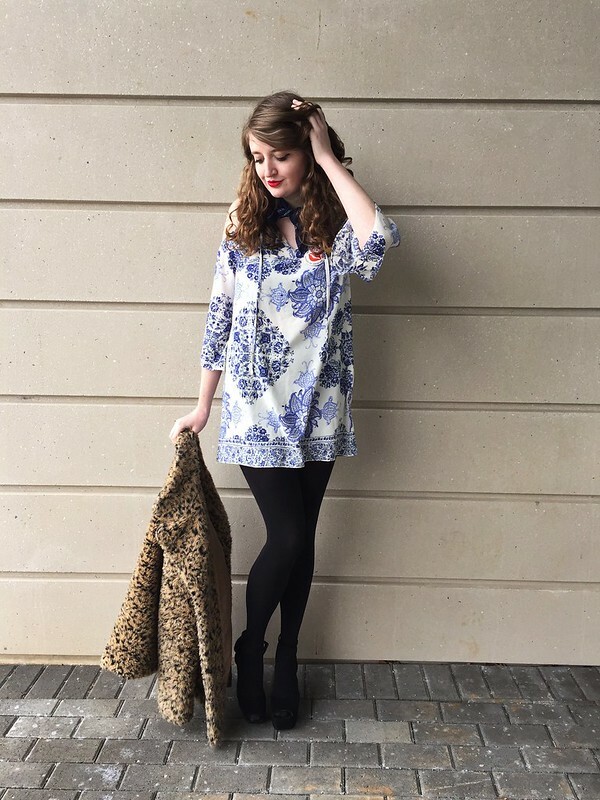 However, I switched things up by pairing a blue and white porcelain print dress with the leopard print coat. This juxtaposition of patterns creates an eye-catching look. I also played around with my accessories for a sort of young, quirky hip vibe. I took on the bandana neck scarf trend and tied a navy blue bandana around my neck to accentuate the blue in the print of my dress. I added a swipe of red lipstick for a bit of an all-American red, white and blue feel. However, this look didn't quite feel complete so I decided to have some fun with this look and grabbed a few quirky vintage buttons including a "dressed to kill" button. I love the small but vibrant bursts of energy that the buttons emit. 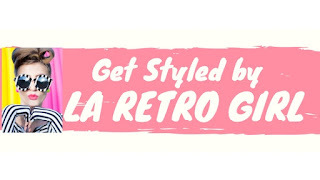 These retro buttons definitely keep this look from being anything but boring! Wear your heart on your sleeve this Valentine’s Day by indulging in your favorite vintage and boho fashion. We have some beautiful pink and red pieces that we think you’ll adore—no significant other required. These finds are great whether you’re heading out for the night, or having a movie marathon at home. 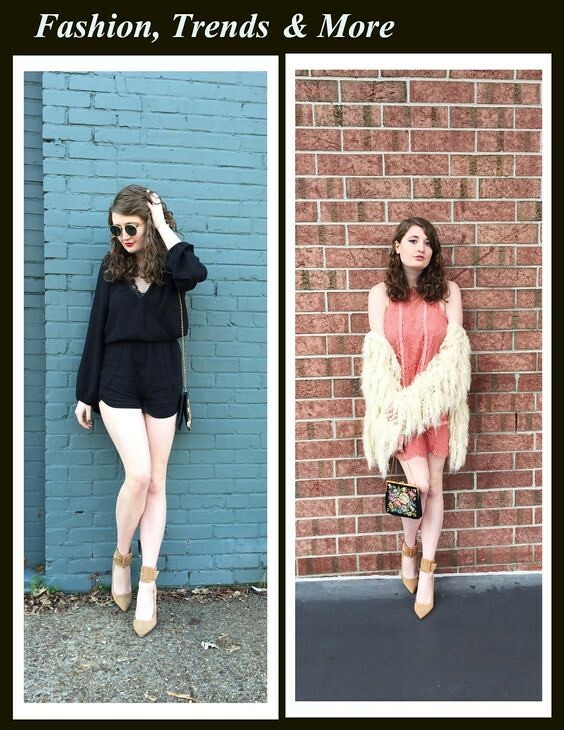 Even though these clothes are fresh off the shelves, they’re a great example of how you can still recreate the sought-after style that you’d normally get from thrifted items. Think pink for Valentine’s Day and into spring by incorporating the dusty pink hue known as Rose Quartz. 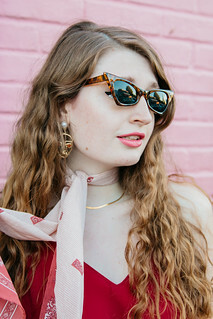 Recommended by InStyle magazine's top ten colors list, which was chosen by the color-predicting experts at Pantone, the milky pink and red cat eye shades from Kate Spade boast an excellent vintage shape and vibe. Bohemian babes, rejoice! The runways have spoken and, according to Harper’s Bazaar, fringe is in. So, we’ve chosen the fabulous red suede X body handbag pictured above from Oasis to complement all of your outfits. Best of all, this little purse will look great with more than just neutrals. Pair it with pink, navy blue, yellow, and more. 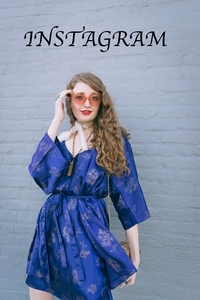 Light, airy, and boho chic, this beautiful floral print bell sleeve romper from Lord & Taylor will be on trend from now through summer, which is why we’ve recommended picking up this piece for your Valentine’s Day festivities or whatever events are thrown your way this season. Still chilly outside? Pair it with cream tights and a beautiful pair of suede beige booties for a gorgeous winter-to-spring transition outfit. Suggested by Lyst for its gorgeous ruby red hue, this little high low mini is perfect for whatever you end up doing this Valentine’s Day. Not only would the Tu Es La dress from Free People look fab with booties and tights for chilly weather, but it would look equally as stunning worn alone with a pair of tall gladiators and sunnies. Whether you’re smooching your sweetie, or you just want to look like you’ve been making out from the waist down, these vintage-style cigarette denim trousers from American Retro are too cute to pass up. If you like quirky, then you’ll love wearing these pants for Valentine’s Day and anytime you feel like starting conversations just by stepping into the room. Pink boots? Absolutely! Office's quirky and fun pink Clueless nubuck leather work boots are great for adding a bit of edge to an otherwise feminine outfit. Pair these with all black, all white, or a combination of colors with tights for winter. Keep these around throughout the spring and summer, too, by teaming with cut off shorts, sun dresses, and more. Now that you’ve had a chance to see our vintage- and boho-inspired Valentine’s Day selections, we hope you’ll have fun incorporating the pinks and reds typically associated with the date. Whether you buy them new or peruse your local thrift store, it's never too early to start planning. If you decide to stay in, the possibilities are endless; and if you’re heading out on the town, pile on the layers for a warm and stylish look. Whatever you do, make sure to have fun and enjoy the process of electing your exciting new ensemble. Hello! Recently, Universitee Box reached out to me to see if I wanted to try a complimentary month of their service. For those of you who are not familiar with Universitee Box, it is a monthly subscription box designed for female college students. They compare their service to a dressed up care package. And that it certainly is! They offer three different boxes- the "bauble" box, the "duo" box and the "alumna" box. The "bauble" box costs about $17/month and contains an affirmation card and 1-3 pieces of jewelry. The "duo" box costs about $29/month and contains an affirmation card, a tee shirt and 1-3 pieces of jewelry. The "alumna" box costs about $35/month and contains an affirmation card, a lifestyle item, a tee shirt and 1-3 pieces of jewelry. 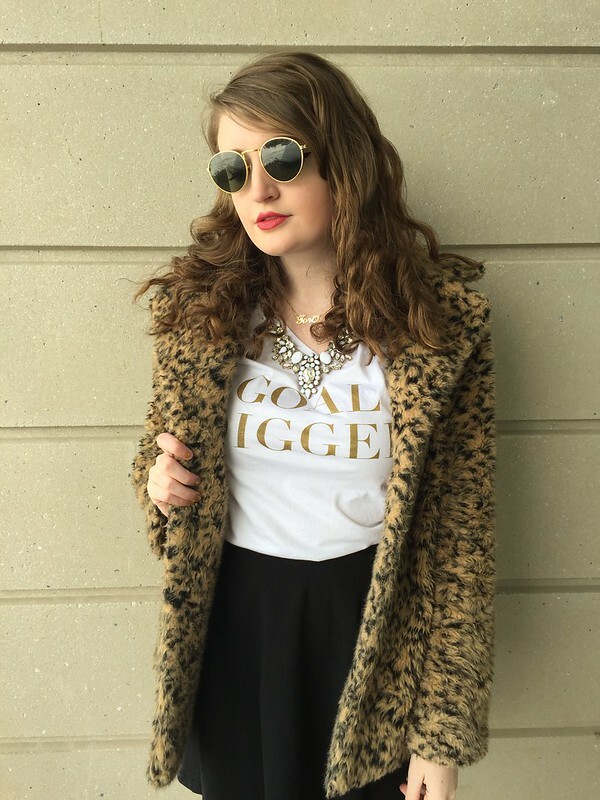 In the January box, I received a stunning statement necklace, cool "GOAL DIGGER" tee, set of pencils, set of goal cards and charming affirmation card. When I received my January box in the mail, I was immediately impressed; the packaging of the box is so pretty and the box feels like an absolute luxury. Although I'm not typically a fan of tee shirts, I'm loving the "GOAL DIGGER" tee that I received in the box. For this look, I wanted to focus on the tee and styled my look around it. I paired it with a simple black circle skirt and black tights to let the tee steal the attention of the look. I styled a major leopard print faux fur coat with the tee to accentuate the coloring of the letters on the tee. 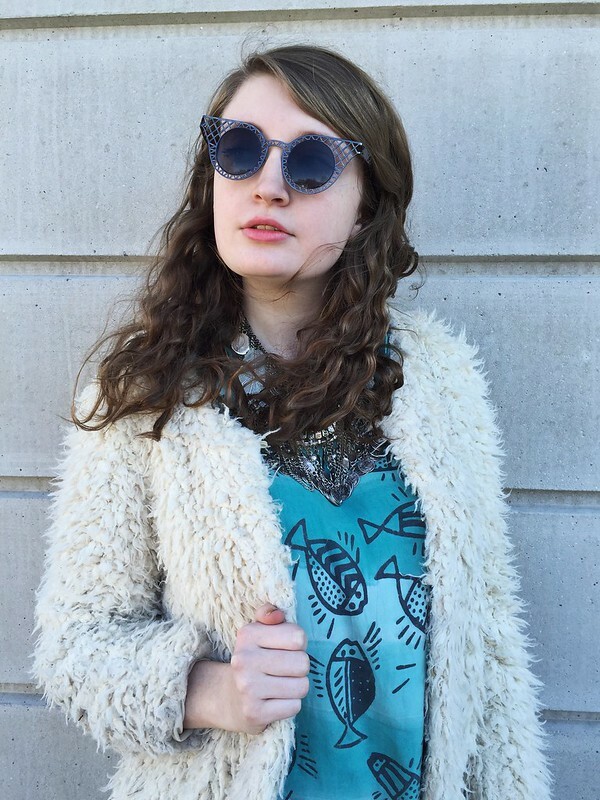 To further accentuate the golden color of the lettering on the tee, I grabbed my statement necklace from my January Universitee box, my golden "Tori" necklace and a pair of golden shades. A feminine shade of pink lipstick pulled the look together.